If you deal with vendors and suppliers on a routine basis, you know how hard it is to bargain and negotiate agreements where everyone (and especially you!) walks away satisfied. 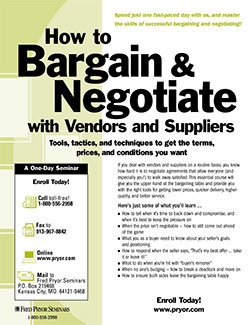 This essential course will give you the upper hand at the bargaining table, and arm you with the right tools for getting lower prices, quicker delivery, higher quality and better service. While some people may be "born negotiators" who relish the entire process and love wheeling and dealing, others (like you perhaps?) experience anxiety and stress when sitting down at the bargaining table. 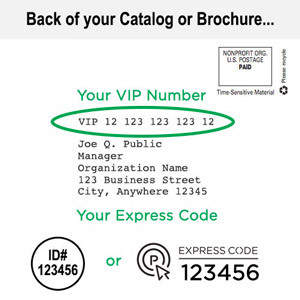 Whether you're negotiating a major deal for new office equipment, choosing a print shop that can get your job done within your budget and your time constraints or hammering out new terms and a contract with one of your long-term suppliers, you'll get it all done more easily, swiftly and positively with what you'll learn here. This course isn't just lecture and theory … instead, it's packed with hands-on exercises, lively discussion and real-world negotiation case studies that lets you practice your new skills under the watchful eye of your expert trainer. You'll learn to map out strategies, develop a bargaining plan and come to the table prepared to play — and win. You'll learn how to read your opponent's unspoken body language, "get inside their heads" and decipher clues to help you gauge their next moves. You'll learn to use your own non-verbal behavior to your best advantage, and master persuasion techniques to guide others toward your way of thinking. You'll find out how to continue the dialogue when your opponent declares his/her offer final, and learn how to negotiate for a host of other options when the seller can't — or won't — budge on price. You'll discover how to negotiate based on cost analysis and how to counter with creative alternatives when the seller comes to you with a price increase. Common myths and beliefs about negotiation — you'll be surprised at what you don't know! Preparing to Succeed — Devise a Plan, Develop Your Strategies and Play to Win! Use These Tools and Techniques to Gain the Upper Hand and Come Out a Winner! What motivates sellers? What are they really thinking? Insider information to help you understand “what’s inside their heads” and use it to your advantage!